At Museum Anywhere, we are 100% focused on mobile and web solutions for Museums, Science Centers, Art Galleries, Historic Sites, Zoos, Aquariums etc. Over time we have developed deep understanding of requirements and that’s reflected in our innovative solutions. Are you still using Audio Tours? Turn your visitor’s walk with audio and video tour! Home/Blog/Are you still using Audio Tours? 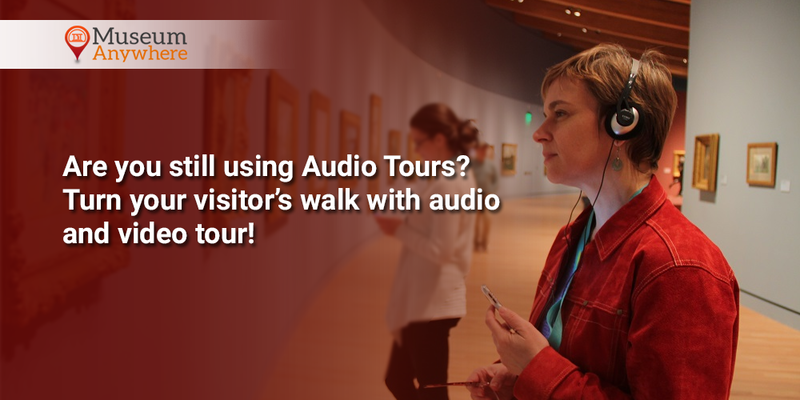 Turn your visitor’s walk with audio and video tour! Audio tours were common but have you thought how by harnessing the technology you can help your visitors experience an overall personalized tour by literally watching the artifacts moving or knowing the information related to history in a more enhanced way by watching a video! We have developed rich, vibrant audio and video tours for museum’s clients that have helped them let the visitors access the tour from any smart mobile device. Whether you are looking for a simple audio video guided tour, an interactive customized museum app, don’t worry we are here. Our team makes it easier to create engaging, educational experiences for your visitors. We all agree to the fact that videos leave a long-lasting impact on the minds of the visitors. Your audience is more into watching a video than listening to long audios. With us, say goodbye to the boring audio tours as our team will help you migrate those to an Audio/video platform. Doing so, it will help in making your visitor’s tour much more interesting and engaging for visitors. You don’t have to buy or lease Audio Tour equipment! We do offer hardware for free. We will provide a multimedia tablet for free and custom design the tour that includes audio, video and detailed text combined with age-appropriate Fun Facts and Trivia! Isn’t that really exciting? Yes, it is. By this we mean the audio and video tour using tablet delivers you the valuable real-time analytics about your visitors i.e., what are the most areas covered by your visitors and which artifacts are most seen. In this way our solution lets you create museum visitor surveys for immediate feedback. Now you can cut down on the costs that you had to spend on audio equipment or say suppose tour guides. With our multimedia solution, we help you remove the burden of keeping museum audio and video tour equipment on hand by providing tablet tours. So museums, it’s time to take advantage of the technology that your visitors are already carrying. To know more you or discuss how audio and video tour solution can be implemented in your museum, write at sales@MuseumAnywhere.com or call 703.652.6630. We would love to assist you and answer all your queries. Previous Previous post: Driving Visitor Engagement by bringing museum’s collection online in the Digital Age! Next Next post: The Digital Transformation of Museums- How museums are going online!